Ask fellow campers about "Mountain View Campground" and nearby attractions. Like other reviewers, we needed a spot to get off the road and had a pleasant night's stay here. The transient sites are in a big grassy field. The laundry was very clean. The lady who checked us in was easily confused and had difficulty giving us directions. She dated our receipt in August instead of June. Bring cash or check to pay. We camped at Mountain View Campground in a Motorhome. Having some delays in Bangor, I had considered stopping earlier than planned, but we continued on to Dixfield anyway. Calling ahead, the lady said that the office would likely be closed on arrival but to just pick a site and come in the next morning. We don't usually arrive after dark, but this was easy to find and the short term sites were in a large level grassy area with lots of room. Finding a site couldn't have been easier. A seasoned couple own this place and couldn't have been nicer. They don't accept plastic, so bring cash. The WiFi and other utilities worked well. We didn't find any local OTA channels. There are a number of seasonal sites back in the woods. We camped at Mountain View Campground in a Travel Trailer. We found this campground on the fly, and couldn't have been happier. We just needed a spot for the night and it delivered. Full hookup (no cable) in a big grassy field. Clean bathrooms, private showers, pool, quiet at night, view of nearby "mountains," friendly management, etc. While the campground has even nicer sites for seasonal campers, of which there were several, ours was great for a few nights. We'll visit again if in the area. We camped at Mountain View Campground in a Motorhome. 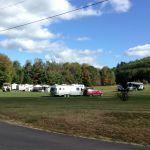 Are you affiliated with Mountain View Campground ?